Our last day in Greece, we had a few hours to spare and a rental car so we decided to look for the ancient battlefield of Marathon. It was here in 490 BC that the Greeks defeated a Persian invasion force. 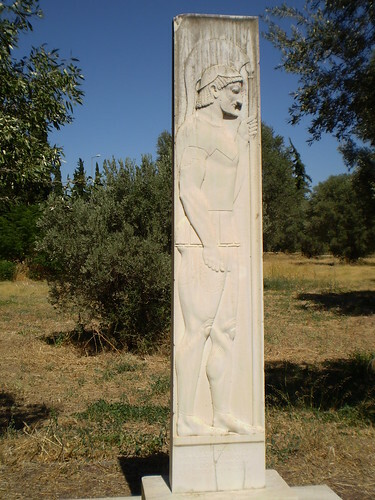 After which a messenger ran the 24 miles back to Athens to declare the victory inspiring the modern marathon race. This was the only time our GPS navigation failed us; apparently “Marathon Museum” was a little ambiguous! Having been directed to the Marathon Run Museum, we got dubious directions toward the ancient battlefield and set out. After several U-turns, we found ourselves traveling down a narrow road through a field where a crowd had gathered. 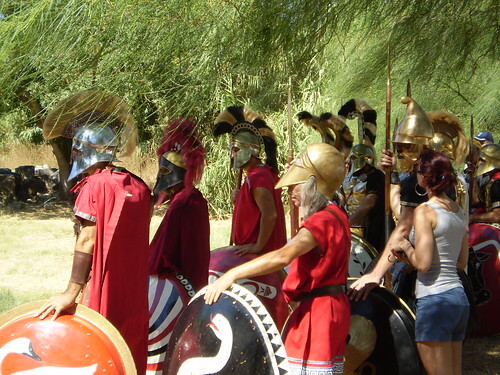 I almost didn’t believe what we saw: ancient Greeks engaged in battle. We watched two teams of maybe 10 “soldiers” perform drills in full armor. While they took a break in the shade, a British man dressed in a gray homespun robe gave everyone instructions about the rest of the day’s schedule. They then broke ranks to drink from anachronistic water bottles and eat energy bars. Apparently we had stumbled across this group of international Greek history enthusiasts who had planned a big celebration at Marathon that weekend. 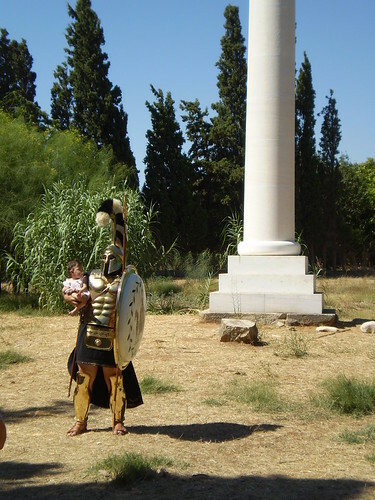 After the Greek victory over the Persians, a trophy of a single ionic column was erected near the battle site. It has since been moved to the Archaeological Museum of Marathon but a new one has been installed in its original location which is where we happened to find the troops. I have to give the reenactors some credit since I myself have been known to take art pilgrimages. (We decided to go to Marathon only because the Daphni Monastery was still closed for restoration.) If you were really into ancient history, to the point of making or buying armor for yourself, then there would be nothing more fun than traveling to an actual battle site, camping out and recreating a little of that past world. Everyone has a place they dream about visiting and whether its an adventurous, nerdy or a luxurious destination, I am always happy to see people finally making the trip. In the end, we eventually found the battlefield but it was getting late and we needed to get to the airport. We literally run past a group of Greek school kids, saw the burial mound and the modern memorial, took some pictures and hopped back into the car. I still have no idea how to get the Archaeological Museum but I guarantee you won’t see any phalanx combat there! Thanks for stopping by my blog, and I am really enjoying what you have here. I look forward to sharing more with you.